Thank you for having me here today. I’m so proud of the Deception characters for helping me tell this story in the best possible way. Nothing is ever easy with demon hunters and that is especially true for matters of the heart. Lillian Dellacourt hates noblemen. Raised in a small village by a seamstress who sold her to the local lord. Like many of us, she’s still overcoming the circumstances of her birth. While The Company sees her as one of the greatest hunters to have ever lived, Lilly still deals with her hatred of noblemen on a daily basis. Being a demon hunter puts her in their company more often than she’d like. You can’t really blame her for her hatred. After all a bad experience can change a person. The man who bought her from her mother was an earl. He kept her locked away and didn’t let her visit her mother. He beat her when she ran away to find her missing mother. Of course, she stabbed him and managed to get away. Unfortunately, his wounds were not fatal. That is how Reece Foxjohn found her and she became a demon hunter. She hates that titled men believe they can have anything they want without consequence. They take without thought and treat everyone below them as chattel. The Earl of Tullering is the only exception. Her friend’s husband is an honorable man, but he is unique for one of his station. Now, the Earl of Shafton is more of the same old nobleman who thinks he is above all of them. His lies and arrogance have driven her to her current mission. She can read his deception, but can’t figure out what secrets he keeps. Plus, the infuriating man made some pretty terrible accusations against her and she wants her revenge. Dorian Lambert has the manners of Marques and the instincts of a demon hunter. It’s confusing. The way he looks at her starts her stomach trembling in a pleasant way and it takes all her effort to keep her feelings at bay. Lilly likes to know exactly what she’s facing. She can take down a demon with her sai blades ripping through flesh and bone like butter. Killing demons makes sense. Nothing about being near Dorian is explainable in words. Only actions will do. It’s maddening! Thanks again for having me here today. 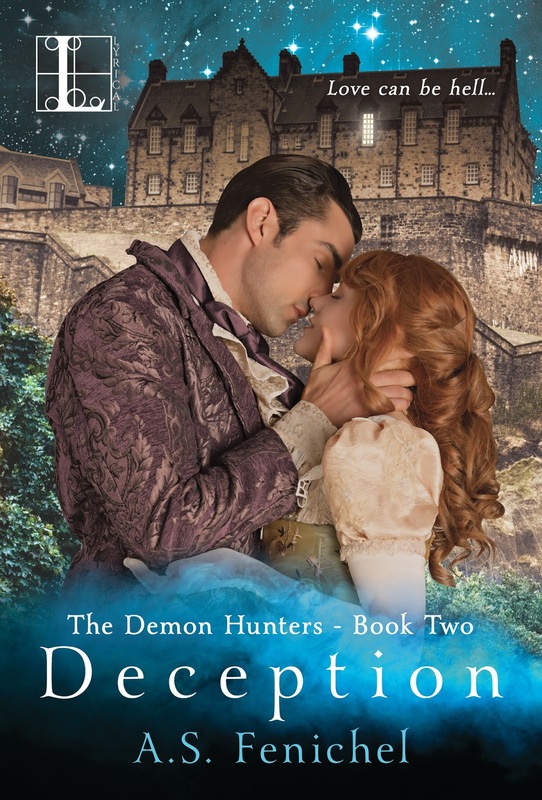 I hope you enjoy Deception as much as I loved writing it. Gripping the chair arms to keep herself seated, Lillian fought an urge to leave and never set foot inside Castle Brendaligh again. It had been a demoralizing battle and they had lost, but they had lived. They had done all they could, but still the demon master had ascended into man’s world. “You failed and we are all likely to die because of it. I hold every person at this table responsible for the state of England. You have ruined us.” Lord Clayton’s voice grated on Lillian’s nerves. Accounts of the battle were clear. Nearly everyone in the room had risked their lives trying to disrupt the ascension, not to mention keep the earl’s daughter, Belinda, from becoming a demon sacrifice. Making such a show of ferocious reprimands insulted their brave and selfless efforts. If not for the fact that he was her best friend’s father, she might have indulged her desire to pull a sai blade from her boot and slice his throat. His bright red face gave her hope his heart might fail and save her the trouble of killing him. Other hunters at the table murmured, but no one spoke out. “Father, really.” Belinda Thurston rolled her eyes. Lillian missed Reece’s steadying presence. Reece might have even been able to stop his lordship’s tirade with a few quick-witted remarks. Her partner had nearly died, and now lay upstairs recovering from demon poisoning. Lillian reached toward her boot and let the hard steel of her sai blade handle bring her comfort. One second and Shafton’s head could be rolling down the long table and land in Drake Cullum’s lap. Besides Shafton, Drake and his assistant, Dorian Lambert, were the only ones present who had not been at the battle. Their leader, Drake, had attended to assign new orders to the hunters. Lillian could kill him and no one would be able to stop her. Of course, there were always consequences when dealing with men in power. She’d lose her home within The Company. Yet another arrogant earl would not take her from her rightful place. She was in control. It was nothing like her youth and the titled man who’d ruined her life. “It was the wrong choice, Belinda. You might have cost us our one chance to stop this.” Shafton narrowed his eyes on Lillian. “You are out of order, Dellacourt.” Shafton said her name as if it were a curse. “Miss Dellacourt.” A warning came from the other end of the table. “You have no right to question me or my motives.” To his credit, he faced her and stared her in the eye. Drake Cullum pounded the table. “Shafton, that will do.” The demon hunters’ leader stood rigid, narrow-eyed. He was formidable when he was calm, but enraging him was never a good idea. He was furious now. Had she gone too far? The idea she might have overstepped her bounds with Cullum was enough to make her relax the grip on her blade. Lillian turned and stormed from the dining room. Shafton yelled something about not having dismissed her from the meeting. Once in the hallway, she pulled her second blade and turned to go back in and finish what she’d started. It would be nothing to remove his pompous head from his shoulders. Cullum stood in the doorway. He smiled at her and closed the door, baring her reentry. Had she ever seen him smile before? No instance came to mind. She stomped toward the front entrance. She’d leave the damn castle, get her carriage, and ride like the devil back to London. Yet the one person in the world she could really talk to was a resident of Brendaligh. Holding her full skirts with both hands, she sprinted up the curved grand staircase. Thanks again, for having me here today, Roxanne.